A lot can happen in 20 years. Rip Van Winkle awoke still loyal to King George III because he’d dozed through the American Revolution. 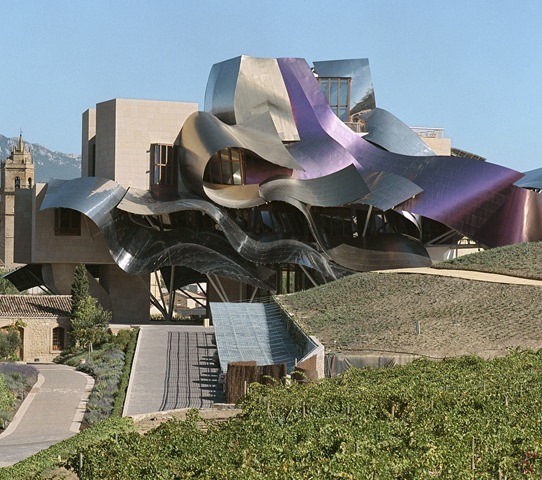 Consumers lately have been awaking to Spain’s revolution: 20 years ago a few had heard of the two marqués—old standby Marqués de Riscal and newborn innovator Marqués de Cáceres, and few other names. Even the stalwart Yago Sant’Gria, once the favorite of the college crowd, had been elbowed aside by Riunite Lambrusco. Things are different now. 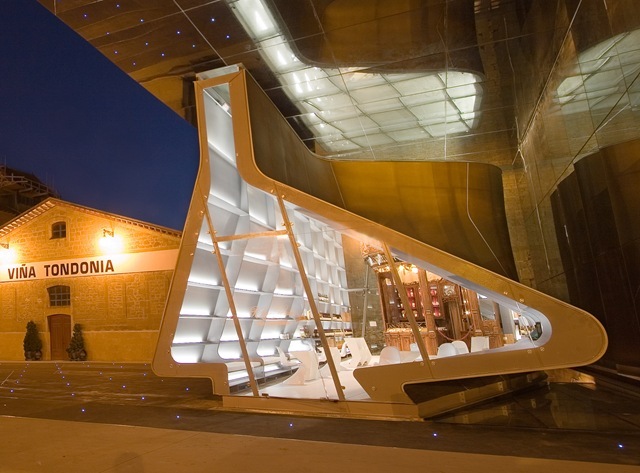 As a late-bloomer in modern wine-making, Spain has benefitted from the (expensive and sometimes harrowing) pioneering of others, and these days she makes a much bigger splash than formerly. 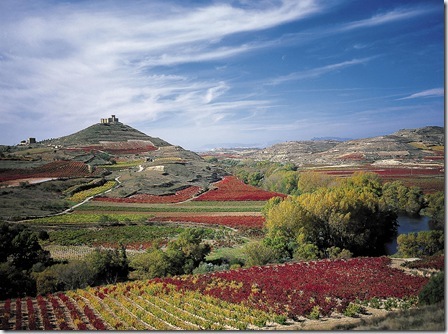 Laguardia: a well-planted outpost of La Rioja. Fortuitously, that’s partly because of the current economy. Late-bloomers may benefit from the pioneers’ R&D, but risk losing in the market, where they often find the shelves occupied by smug pioneers preening themselves on their foresight. Not this time. Value sells in the best of times, and in the current economy almost everyone’s looking hard at the price-quality equation. And, says Rioja ambassadress Ana Fabiano, “they’re impressed by Rioja’s value proposition.” Which is considerable. Nearly 300 bottlings were presented at a recent tasting in Manhattan’s Puck Building, and although there was an adequate supply $50, $75 and $100+ bottles for those who have more money than Warren Buffett put together, more than a third of the total will retail at about $12, often less. My venerable colleague Don Cojones, a latter-day Spanish knight and tilter at wind turbines, says that’s expected with Viña Herminia’s or Valdeguinea’s 2008, or Primicia’s 2009 (all 100% Tempranillo)—they’re in the joven category, made-this-year-sold the next. Still, there were others comfortably in the same price range that had some bottle-age behind them: from Diez-Caballero, Clisos, Banda, Torres, Bordón, Ramón Bilbao, Faustino, Beronia, Solar de Randez, Noemus, Antaño, Solnia, Añares, Navajas, Promesa, Lacuesta, Age Siglo and others. The same obtained for whites, mostly made from the Viura grape (a.k.a. Macabeo), and some rosados, too. In short, we paupers do not suffer. Not to say they stop there. 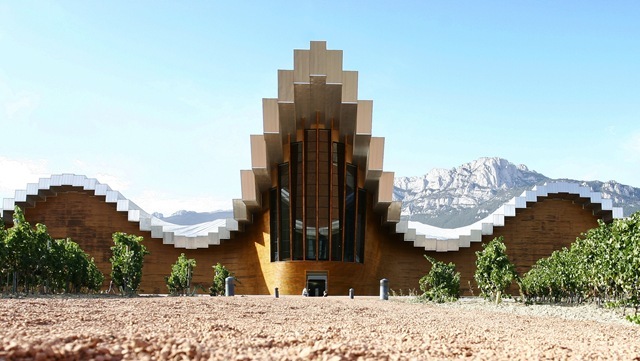 most of the Rioja producers above go on and up from “value wines” to fancier and pricier stuff, in the same realm as Roda, Eguren, Paganos la Nieta, Vivanco, et al. Riojas traditionally and tyypically have been about 70% Tempranillo with the remainder Garnacha, Graciano and Mazuelo, but there’s been a move to 100% Tempranillo. At this event 100-percenters outnumbered the blends 137 to 92, and more than a third of the blends were 90% Tempranillo or more. This is reminiscent of Chianti Classico producers who in recent years have steadily reduced the percentage of blending grapes, native or international, in order to concentrate on their native star, Sangiovese. Indeed,one of the blends—a 2004 Castillo de Sajazarra Reserva took its Tempranillo to 98%, with the risible remainder being Graciano. Jake Zeitlin, a rare-book dealer from the last century, used to advertise “Castles in Spain Free with Every Purchase.” My neighbor Doble de Luce, a failed actor and brother of Traje de Luce, a multiply gored bullfighter, says Spanish wine producers ought beg, borrow or steal that slogan. Marqués de Riscal ‘s dramatic new winery in Elciego looks like the wrapping the Bilbao Guggenheim came in. Both were designed by Frank Gehry.